If you do a lot of carpentry works, you must know that there are numerous types of clamps. Each clamp has unique characteristics and functions, but they all have similarities in function. Clamps hold two objects together while you work on them, giving you extra hands in working on complicated projects. Interested in building your own constructions? 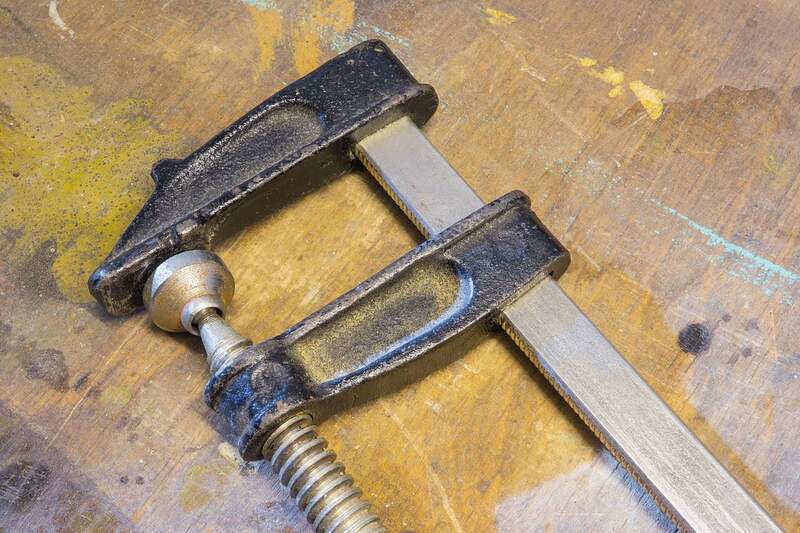 Understand different clamp types first before filing up your garage or studio with tools. Also known as “C clamp”, G clamps are the most common and widely-used. A G clamp is used to stick two objects together when you work on them. You can also stick an object to the table using this clamp, so the object stays in position. You can find clamps with various opening widths, from one inch to eight inches. Another common clamp, spring clamp is used in various objects, from woodworking to jewelry making. This clamp has PVC finger cushion and spring mechanism that secures the object. You can use this clamp to work on small objects, such as putting ornaments on delicate jewelry item. F clamp has similar uses to G clamp, but the former provides a wider opening. F clamp is used as an alternative when even the largest G clamp fails to support the job. F clamp is also popular for various works, such as woodworking and metalworking. The parallel clamp is one of “wood clamps” type, designed for medium-scale woodworking projects. The parallel clamp has a really large opening, but its mechanism prevents dimples or dents when used on wood. Locking clamps are small clamps that you can use with one hand. Also known as “quick grip clamps”, these clamps are used in any works that require quick action. Locking clamps are ideal for any works, from woodworking to metalworking. They are useful in a welding work, when you need to provide a sudden strong grip without changing the position too much. Need to secure two axes when assembling a construction? Use edge clamp for easier positioning. This clamp has three screws in different positions, which secure the axes on both sides and the top. Edge clamp is popular for woodworking and welding works. If edge clamp is used to secure axes, miter camp is used to work on corners. This clamp is important to create sound, straight assemblies. Miter clamp will secure two boards in a neat, 90-degree corner area. This clamp is ideal for woodworking projects, such as constructing furniture. Sash clamps are long clamps used in large-scale assembly or construction projects. The clamp has a long metal bar with a fixed jaw, which you must adjust with a screw. Sash clamp is used to construct large furniture. Depending on the project scale, you may need to use more than one. As the name suggests, battery clamp is used on vehicle batteries. They usually come as plastic clamps with copper tips. The plastic part is a nonconductor, protecting you from getting electrocuted. Battery clamps are usually sold in a bunch due to their small sizes. A hose clamp is designed specifically to connect a hose to a fitting. This clamp is commonly seen at homes, garages, or any places with piping and plumbing systems. The hose clamp is also common among farmers and gardeners, who use a hose irrigation system for their plants. Frame clamp is used to construct a picture frame. A frame clamp consists of several small clamps that are connected to form a square or rectangle. The result is a straight, properly-arranged frame piece. The square also helps you create a proportional center area of a frame. Sheet metal clamp is one of the most important metal clamps. It is used to secure two metal sheets together. The tip of the clamp has wide plates that press down on both metal sheets. This small clamp can be used with one hand. Flooring clamps are wide clamps used to install wood panel floor. This clamp can hold up to 10 floor boards at the same time. Flooring clamp is used to keep the boards in a straight position during floor installation. Kant-twist clamp is used in woodworking and metalworking to secure nonparallel surfaces. The name derived from the phrase “can’t twist”, which means that the jaws stop the clamp from twisting or moving from the center. Also known as “bench clamps”, toggle clamps are big clamps used to insert screws to the table or flat surface. Toggle clamps are used to construct any piece (especially wood) that stands on legs. However, it can also be used in metalworking projects. Scissor clamp is used to perform heavy lifting. The clamp mechanism acts like scissors, applying pressure to the load and provide a better grip. Scissor clamp is heavy and strong, designed to withstand various load types, from merchant goods to metal plates. Pneumatic power clamp is used in large-scale production. The clamp is operated using air pressure instead of hand, providing better strength and speed. Pneumatic power clamp is used in industrial and machinery fields, which require quick actions. Another high-power clamp, hydraulic clamp uses pressurized liquid power to operate its mechanism. The clamp is known for its high control level. It is more expensive than pneumatic clamp, but it offers more accuracy aside from power. Web clamp has a strap used to secure uneven surfaces before you work on them. The band is used to forcibly secure surfaces based on specific sizes and diameters. Web clamp is popular for woodworking, but it can also be used to secure transported loads. Locking chain clamp works in the same principle with web clamp. It is a small, one-hand clamp used to secure a pipe or other uneven structure. You secure the object by looping the chain around it before applying pressure. You can buy rubber clamps versions of these clamps, which provide rubber grip for secure handling. Different clamp types offer unique functions. Some are used in various projects, while others have more specific mechanisms. Understanding the types of clamps will help you decide the best tools to have.